Add melon and berries to pan of boiling water. Return to boil; cook 1 min. Drain; rinse immediately with cold water. Drain well; place in bowl. Add dressing and sugar; toss to coat. Salad can be prepared ahead of time. 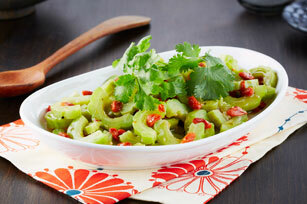 Refrigerate up to 24 hours before garnishing with coriander and serving. This delicious salad can be part of a healthy eating plan. And as a bonus, the goji berries provide an excellent source of vitamin C.